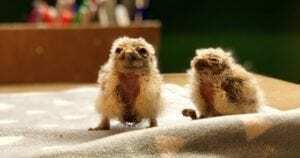 Two adorable Burrowing Owls were hatched at Woodlands Family Theme Park located near Dartmouth. Ernie hatched first on the 9th of January closely followed by Els on the 11th of January. 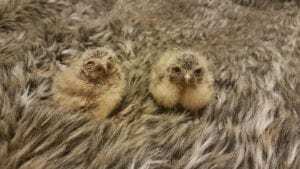 These are the first chicks to be hatched from their parents Bonnie & Clyde who have been at the Falconry Centre since 2014. The chicks were named after the South African professional golfer ‘Ernie Els’ as Ernie hatched on Falconer Lyn’s birthday who’s favourite hobby happens to be, you guessed it golf. Burrowing Owls are found in North and South America and live in open grasslands, deserts, agricultural areas, golf courses and airports. Their diet consists of mice, lizards, grasshoppers and spiders. The burrowing owl derives its name from the place in which it makes its nest, usually excavated and abandoned by prairie dogs but can and will make their own burrows. Ernie and Els were removed from their parents at 9 and 11 days old to ‘imprint’. Imprinting is a very important part of a bird’s life as the chicks will be joining the flying display team and need to build a special bond with Head Falconer Gail and Falconer Lyn. 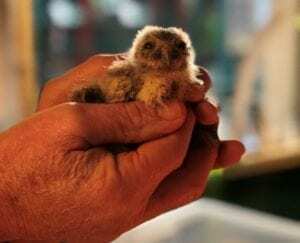 Guests can visit the two Burrowing Owl hatchlings at Woodlands Falconry. Make sure you keep an eye on the Woodlands Facebook Page for more news and photos on any new arrivals to the park.